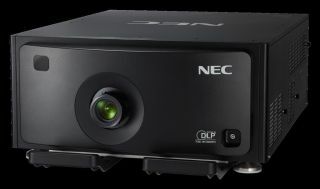 NEC Display Solutions of America has introduced two new laser phosphor projectors to its professional installation lineup. The technology behind the lamp-less projectors gives professional installers applications to target and potential revenue streams. The NEC PH1201QL projector delivers a native 4K (4096x2160) resolution, while the NEC PH1202HL model delivers 1080p as its native resolution. The 3-chip DLP laser projectors each emit 12,000 lumens of brightness, and maintain 2000:1 and 10,000:1 contrast ratios, respectively. The lamp-less projectors use blue laser with yellow phosphor as their light sources and emit consistent light output over their lifetimes. That means mercury-free components, no more lamp replacements, and 20,000 hours of projector life at maximum brightness. The eco-friendly projectors are virtually maintenance free, which translates to lower labor costs and less filter cleaning. The PH1202HL offers NEC's unique heat exchanger, a patent-pending system designed to cool the engine while creating a sealed barrier for both the optical and laser engines, thereby minimizing dust and other particles from entering the laser and optical path. The barrier helps reduce maintenance requirements. The projectors can operate in a 24/7 environment. The self-contained projection system of the PH1202HL projector includes an OPS (Open Pluggable Specification) option slot, the first industry-wide standard to simplify installation, use and maintenance while offering input flexibility for HD/SD-SDI and OPS accessory cards. The projector’s wide range of installation features suit any professional environment and minimize installation costs for digital signage. The PH1201QL and PH1202HL projectors ship with a three-year limited parts and labor warranty, and will be available in April 2015 at a minimum advertised price of $149,999 and $59,999, respectively.